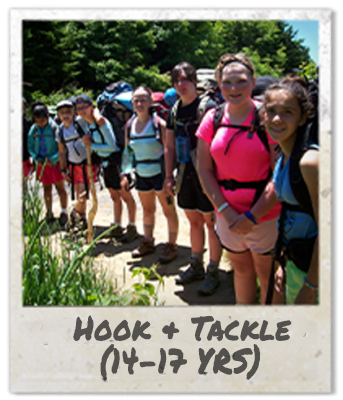 Our newest Teen Adventure, Hook and Tackle is a fishing expedition that focuses on traditional fishing methods spanning shoreline, canoe, and fly fishing in various lakes and streams of Western NC. We utilize catch and release model that also teaches proper handling, preparation, and consumption of catch. Some excursions will include a basic camp setting following hikes or canoeing to some of the area’s best secret fishing holes. Group dynamics provide practice with socialization, teamwork, and problem solving. Campers must be willing to bait their own hooks. North Carolina Licenses and permits are included in tuition. Hook and Tackle campers are challenged more through learning to master a complex skill and work cooperatively than by highly-physical tasks. Campers practice focus, patience and persistence as they learn the various skills involved in fishing. When on outings, the group divides gear to carry and chores to complete, and counts on each member to help the group as a whole progress. At times, weather and other natural elements require a change in plans, and the group must navigate unexpected changes. Through all of this, the counselors are ensuring the safety of the group, and guiding them through the development of a small community. Problem-solving is about real issues that directly affect every member of the group. They return as accomplished fishers with a greater understanding of their place in the natural world. group prepares by learning fishing, paddling and camping skills and taking day trips to build leg muscles and improve fishing technique. The staff are highly-trained in wilderness safety skills and maintain contact with camp via SPOT pagers as needed. Hook and Tacklers take a break to climb trees at camp and fit in some favorite camp activities. But usually, they can’t wait to get back to the fish!